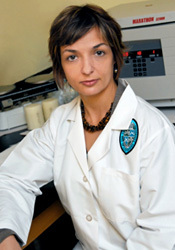 Dr. Bazzano is an Associate Professor in the Department of Epidemiology at Tulane University's School of Public Health and Tropical Medicine, and is Director of Tulane's Center for Lifespan Epidemiology Research. She received a Bachelor of Science degree in biology from Newcomb College. She earned an MPH and a PhD in epidemiology and an MD from Tulane University. She was awarded the American Medical Women's Association Janet M. Glasgow Memorial Achievement Citation, and was admitted to the Alpha Omega Alpha Medical Honor Society. She is board certified in internal medicine, for which she did her internship and residency at Beth Israel Deaconess Medical Center, Harvard Medical School. Dr. Bazzano has a research focus on cardiovascular disease and its risk factors. Her primary emphasis has been on the role of cardio-metabolic factors such as obesity, lipids and glucose in the development of vascular disease. She has led a number of NIH-funded research projects that explore the role of diet in hypertension, obesity, and other metabolic risk factors that lead to chronic disease, producing more than 100 peer-reviewed publications as first author or co-author. She was awarded the Lynda B and H. Leighton Steward Professorship in Nutrition Research in 2014. Her analysis of the relationship between fruit and vegetable consumption and cardiovascular disease has been cited more than 700 times, and her 2014 clinical trial on macronutrient composition of diets and risk of heart disease garnered attention from major media outlets including the New York Times, Time magazine, and National Public Radio. She has been consistently involved in SSCI activities over the past 10 years. Dr. Bazzano presented a State-of-the-Art Lecture entitled "Folic Acid Supplementation and Cardiovascular Disease" during the cardiovascular session of the annual scientific meeting of the SSCI in 2009. She has moderated sessions at the Southern Regional Meetings, and published articles in the American Journal of the Medical Sciences, and presented in both oral and poster sessions at SSCI meetings. She has experience mentoring PhD, post-doctoral trainees and junior faculty who have won awards from the SSCI.